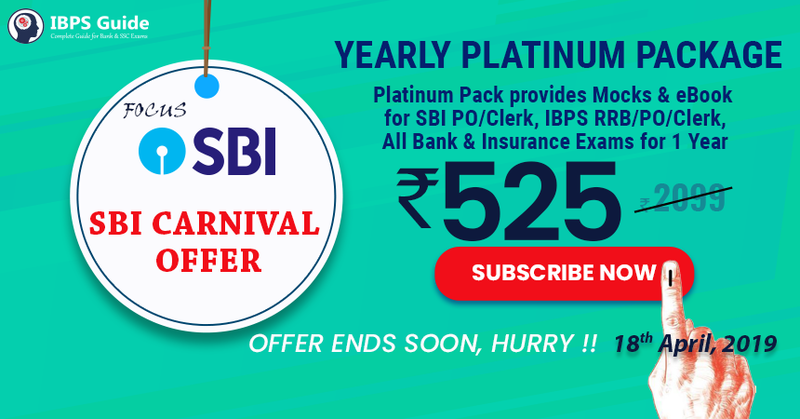 Our IBPS Guide is providing High-Level New Pattern English Language Questions for SBI PO 2019 so the aspirants can practice it on a daily basis. These questions are framed by our skilled experts after understanding your needs thoroughly. Aspirants can practice these high-level questions daily to familiarize with the exact exam pattern. We wish that your rigorous preparation leads you to a successful target of becoming SBI PO. Directions (1-10): In each of the questions given below a sentence is given which is divided into four parts. Out of the given 4 parts, one is grammatically correct and the rest are not. It is then followed by options which gives one of the option as a correct one. Choose the option which is grammatically correct. If all the parts are grammatically correct choose option (e). They argue that until policies are not tweaked in favour of farmers to address their risks related to production, weather-disaster, price, credit and market, the loan waiver will become a periodical instrument for temporary relief. A Study of Budgets analysed the previous experiences with loan-waiver schemes and concluded that debt relief helps in reducing household debt but there appears to be no evidence of increase in investment and productivity of beneficiary households. This narrative has seen some setback recently in the minds of investors, with announcements of farm loan waivers, stepping back from oil price deregulation and events around the Reserve Bank of India. Population growth requires supplies of more nutritious food at affordable prices, but increasing farm output is hard given the fragility of the natural resource base since humans have outstripped Earth’s carrying capacity in terms of land, water and climate change. Increasing farm output beyond sustainable levels can cause permanent damage to ecosystems, the report said, noting that it often causes soil erosion, pollution with plastic mulching, pesticides and fertilizers, and a loss of biodiversity. Over the last few years, there have been sterling initiatives from certain gated communities of this area, where they have graduated from source segregation to composting their biodegradable waste. Farmers can expand land use to help make up some of the difference, but that option is constrained in places like Asia and the Pacific and urbanisation is eating up still more land that once may have been used for agriculture.